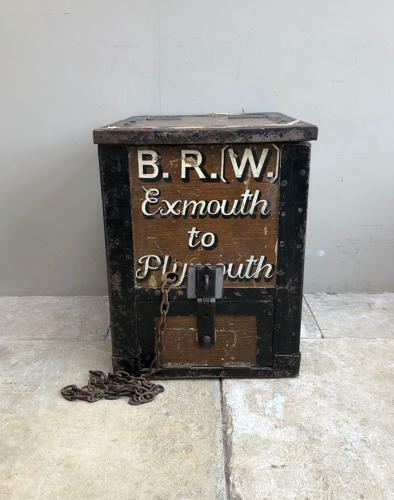 I had to buy this Railway Strong Box as although I know nothing about Railways it just makes the coolest seat or side table....Dating to the 1940s B.R.(W.) British Rail West..it is in complete original condition with FANTASTIC original paint. So many pieces today have been painted to look like this but this is all genuine. The writing is on the front and both sides. There are two large cast iron side carrying handles. The top only lifts up about 4" to an internal scoop? The bottom drawer is locked and there is no key and a chain is coming out of a hole. I think, and if you know please tell me...it was used to put the daily takings in which is why the top is like this so once in it cant come out and the drawer locks to keep it safe. The chain is to attach to the box to something so it cant be carried away or stolen. Anyway this is why I am selling it as a side table or stool and not a useable box - but of course if you have a key or a skeleton key that fits then it is a different matter. It is very heavy and is Collection or Courier UK £45 (Not including Scotland).